One of the biggest changes in our budget is the need to account for an additional person when it comes to family outings. Everything from plane tickets, to dinners out to attending our local hockey team now have three people instead of two. Though this is something we obviously expected with a child, it was nice to enjoy the early days! Gone are the newborn days when she would quietly sleep through the odd dinner out or stay snuggled in my arms, usually asleep during a local hockey game. The little girl is a full grown toddler who now demands her own meals and requires her own seat and if we’re not careful, it can get crazy expensive. While there are certain things we can’t do anything about, like extra seat for airplanes there are many other areas you can save on. Eating out isn’t a huge part of our lives (I’d much rather entertain at home) it does happen occasionally. When possible, we opt to look for restaurants that not only have a kids menu but offer discounts for kids such as kids eat free. Growing up we would go to a restaurant where they offered free Shirley Temples for kids and my parents had to pay $0.10/pound of body weight for kids under 12. Though restaurants probably can’t get away with literally weighing kids in the restaurant anymore, there are still many places the have kids eat free with the purchase of a regular entree. Online sites such as Groupon can be a great place to find coupons and deals for a family that makes an otherwise unattainable event, possible. This can include things like buying discounted restaurant (I often buy gift certificates for our favorite restaurants when they come up at 50% off) or deals on ticked events. Our local movie theater caters to families during regular school breaks such as spring break and Christmas break by putting on discounted days and promos like buy one ticket get one 50% off. During the rest of the year they offer a cheap ticket price on Tuesday. Going to the movies on Tuesday if the only way I pay, especially with children. If you don’t know, call and ask! Friends of ours always take advantage of our local stage theater by taking their kids to ”pay what you can” night. Basically you show up on the first Tuesday of the seasonal performance, stand in line and pay whatever you can. Tickets normally start at $40 per person but on this night you can pay as much or little as you want.When you have a family and a budget this sort of event is perfect. This is something the theater has always done but never makes a big public announcement. Good deals usually require some digging! Sometimes it pays to have a kid (in terms of savings acquired). If I wanted a membership to our local rec center I would be looking at $600 per year as an individual or I could get a family price (no limit on children) for $750 for the year. My husband, daughter and I can all capitalize on the gym, pool, rink and hundreds of classes for only $150 more per year and as our family grows the price stays the same (as is it locked in as long as you renew annually). This membership also gives us some ”free” events to partake in during the year when we’re looking to have a little family fun without breaking the bank. 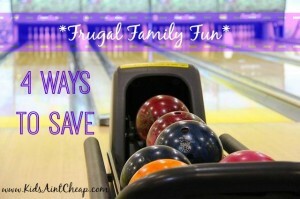 How do you save on family fun?